Gambling—the waging of something of value to get a greater return—is an international craze. Though it is super popular in the U.S., England, and other major western countries, it is also engaged in by countless people from all different types of countries. It is easy to say that gambling gained popularity because of its addictiveness. However, the history of gambling is a fascinating trip that anyone who is interested in this activity should take. Believe it or not, gambling stretches back all the way to the Paleolithic period. Around 3000 BC in Mesopotamia, a six-sided dice was used in that land, based on archaeological findings. However, what is interesting to note is that that dice were based on astragali, which is marked talus bones that were used in rituals in prehistory. So, these marked bones that were previously used for funerals and other special ceremonies began to employed in games like gambling (Schwartz, David G.). The next recorded sign of gambling occured in China. According to the website Gambling.net, “…the earliest concrete evidence comes from Ancient China where tiles were unearthed, which appeared to have been used for a rudimentary game of chance. The Chinese ‘Book of Songs’ makes reference to “the drawing of wood” which suggests that the tiles may have formed part of a lottery type game. We have evidence in the form of keno slips that were used in about 200 BC as some sort of lottery to fund state works – possibly including construction of the Great Wall of China” (“The History of Gambling”). The connection between gambling and government finances in countries around the world can still be seen today. It is not clear if the Greeks were influenced by other cultures who previously had gambling games in their societies, but it is certain that around 500 BC, the first mention of dice was made by Greek poet Sophocles. As explained by Gambling.net, this Greek fascination with gambling extended to Rome: “the Ancient Greeks and Romans loved to gamble on all manner of things, seemingly at any given opportunity. In fact all forms of gambling – including dice games – were forbidden within the ancient city of Rome and a penalty imposed on those caught which was worth four times the stake being bet. As a result of this, ingenious Roman citizens invented the first gambling chips, so if they were nabbed by the guards they could claim to be playing only for chips and not for real money” (“The History of Gambling”). So, it can be seen that the addiction to gambling and love of the game was inculcated in the ancient Greeks and Romans, despite government laws against it. A big development in gambling happened in the 9th century in China. Playing cards started to appear, but the rules of the game played at that time has not been uncovered. However, the cards that were employed during this period hardly resembled the usual 52-card set that we have today. These games in China eventually moved onto Japan before the 14th century (Murdoch, James, and Joseph H. Longford). After a while, card games took hold in Europe to a greater extent. According to the website Gambling.net, “The earliest game still played in casinos today is the two player card game of Baccarat, a version of which was first mentioned as long ago as the 1400s when it migrated from Italy to France. Despite its early genesis, it took hundreds of years and various evolutions to arrive at the game we know today. 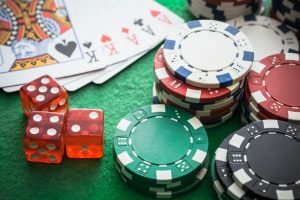 Although different incarnations of the game have come and gone, the standard version played in casinos all over the world came from Cuba via Britain to the US, with a few alterations to the rules along the way” (“The History of Gambling”). Thus, the first casino-type game was played originally in Italy. Gambling is enjoyed in practically every country, and that can be seen from its history. The first signs of gambling appeared in Mesopotamia around 3000 BC, and popped up in ancient Greece, Rome, China, Japan, and then onto Italy. Whether the practice of gambling is good or not, the history tells that people have been enjoying it since our earliest civilizations. Schwartz, David G. Roll the Bones: the History of Gambling. Winchester Books, 2013. “The History of Gambling.” Gambling.net, www.gambling.net/history/. Murdoch, James, and Joseph H. Longford. A History of Japan. K. Paul, Trench, Trubner & Co., Ltd., 1926.